There are things I don’t do well, and sometimes I get so caught up focusing on those things, that I stop doing the things I can do. 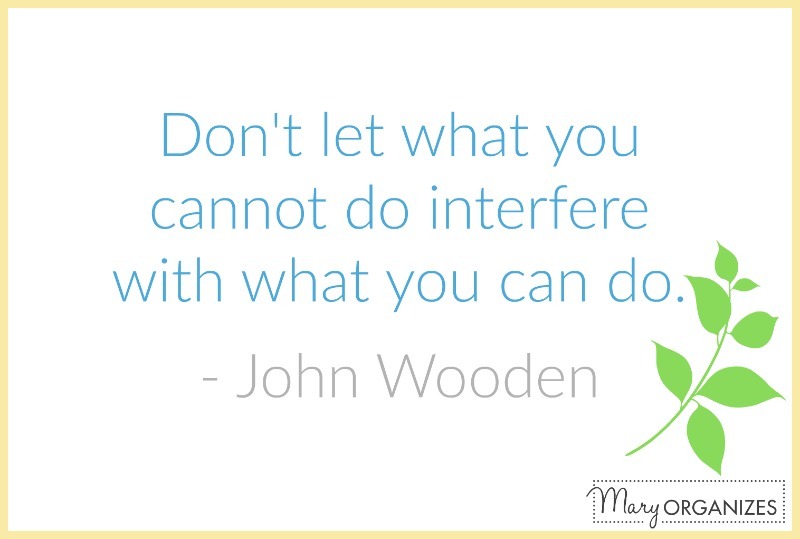 One of John Wooden’s best pieces of advice is “Don’t let what you cannot do interfere with what you can do.” Another way of saying that is “don’t let what you can’t do get in the way of what you can do.”* This message is applicable to every area of our lives, but today I’m going to relate it to decluttering and getting organized. Control Other People: I hear it a lot from readers and clients – they are ready to make a change to declutter and get organized, but their family members are not. Unfortunately, we can’t wave a magic wand and inspire those around us to get on board or control how others react to our attempts. 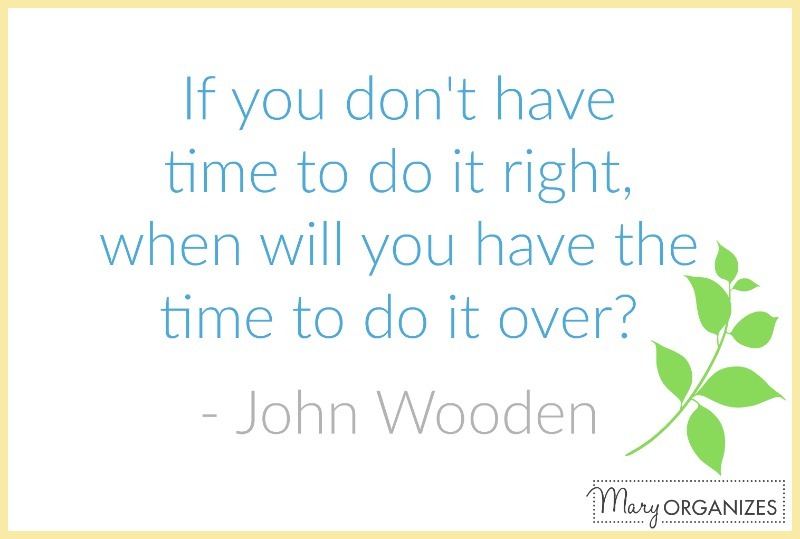 Be Perfect: Let me break it to you right now, you will not declutter or organize perfectly. Every time I do it, I find things that I probably should’ve decluttered the last time. And I know many participants can’t do the declutter task every single day, even when they plan to, because life happens. Compare: Our journey and result will be different from everyone else. When we stop to compare, we lose focus on the progress we’re making and waste time. One past declutter challenge participant told me about her experience. When she started the challenge, her husband didn’t think she would follow through with it. He wasn’t cruel, but was not supportive. Week after week, she followed the decluttering plan in the 91 Day Decluttering Challenge as best she could and eventually the amazing progress she made was undeniable. Her success inspired her husband and he saw that she COULD do it. He became so supportive by the end of the challenge that he was doing it along side of her. Will this happen every single time? No. Either way it is still worth the effort. 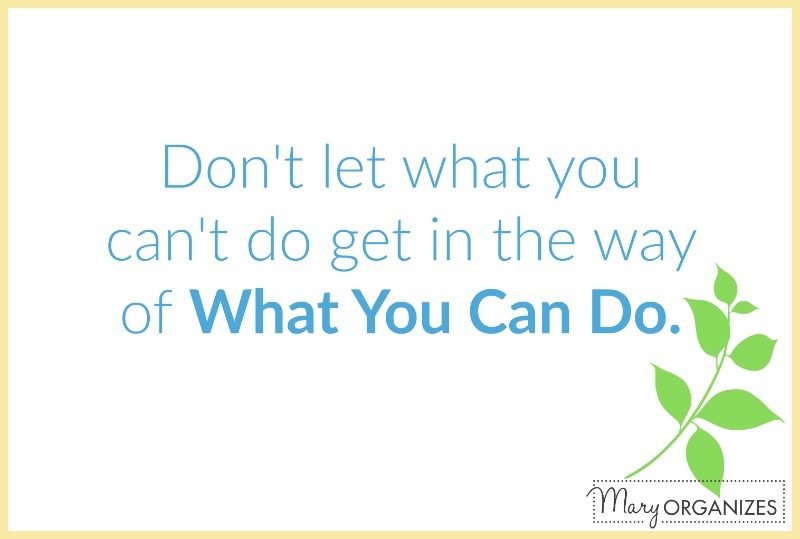 Don’t let what you can’t do get in the way of what you can do. Perfectionism is that feeling that says do all or nothing. Do it all perfectly or don’t try at all. Perfectionism is rooted in unrealistic perceptions and expectations of ourselves. First we believe that we can or should do something perfectly, and secondly, we believe that we have failed if we haven’t done things perfectly. Perfectionists live a haunted life of obsessing over doing something perfectly and then feeling like a complete failure when they don’t. Perfectionism is no way to live a happy life. I have to say that resolving not to be a perfectionist does not mean giving in to being sloppy or not trying. That is actually giving in to the “do nothing” side of your perfectionism. Many perfectionists live in very messy environments because in their all or nothing approach to keeping house, they choose nothing. Doing your best means trying to do it right, but stopping before it crosses the line into obsessive. Do the best you can and let that be enough, because it is enough. In my experience, comparing myself to others only makes me feel inadequate and feeling inadequate is paralyzing to progress. 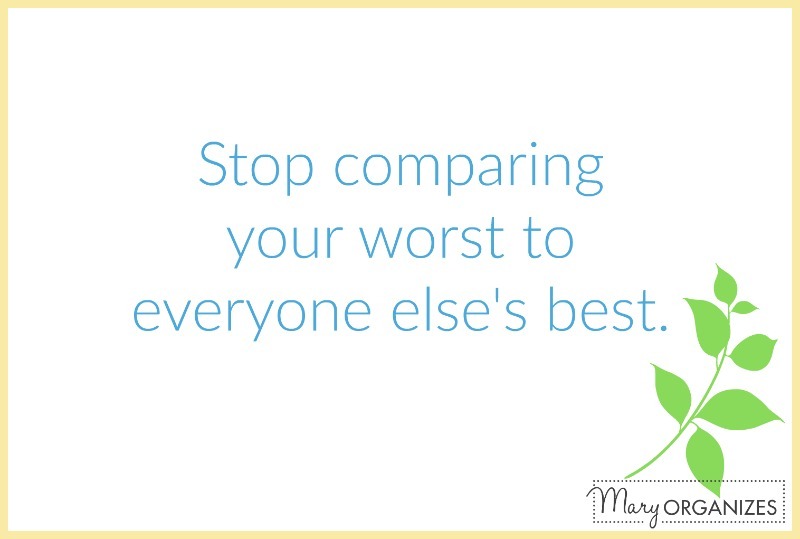 When we compare, we have a tendency to compare our worst to everyone else’s best. No one can live up to that. No one is doing awesome 100% of the time. Comparing is such a distraction away from what truly deserves our attention: doing what we can do. Whether you’re trying to declutter and organize, or whether you’re working on something else: give yourself grace, allow yourself to be human and make mistakes, and then focus on working hard at what you can do. Don’t let the things you can’t do get in the way of that. You can do this! I’ve organized the challenge in a way that is do-able for you. The facebook group is there for every day support and you can always comment on posts to get replies from me. You can do this! So needed to hear this in more than 1 aspect! You are not alone! So many of us relate to one or all of these things! Wow, were you writing this blog about me? The do all OR nothing? ME ME ME! You are not alone! You might be surprised just how common this is! Last decluttering challenge I only completed one of the 91 days. I just tell myself “That is one day closer and that much less clutter than I would have had otherwise.” Thanks for the challenge and especially thank you for this reminder to just do what we can. Hello. The Facebook group link will not work for me. What is it again? I keep getting an error message. Maybe it’s because I’m on my phone? I’m not sure. Maybe try it from a desktop. That is definitely the link to the group and it is very active right now, so I know it is working. Good luck! The page you requested cannot be displayed right now. It may be temporarily unavailable, the link you clicked on may have expired, or you may not have permission to view this page.” Is it a secret group? Has the url or name been changed? It seems that – instead of approving my request to join the group – I was blocked. Please unblock me. I’ve removed the block. I can’t remember the exact instance of why you were blocked, but please read the about section and make sure you are following the rules. It is hard work keeping such a large group in harmony. I think someone may have clicked the wrong button by mistake. I had never heard of this group until a few days ago. I asked to join and then – instead of being approved – I was blocked. I have never been in your group. I just heard of your blog last week. How could I “stick to the rules so it doesn’t happen again”? Now both of my accounts are blocked. This is not funny at all. I requested to join as Elizabeth Alexandria Hoffmann and then as Alexandria Elizabeth Hoffmann. Why am I being blocked? I really wanted to follow your blog and advice but it seems I am not wanted. I finally found you in the list of blocked people and unblocked you. I asked the other moderators if they remember blocking you and no one does, which means it must have been an accident. I’m sorry for all that frustration, but you are in now! My comment about following the rules was probably insensitive since you’ve never been in the group, I am just so used to having to respond that way. The group is so enormous, which is wonderful, but it is also terrible at times! Thanks for your patience. Best of luck in the challenge! How do I sign up for your blog emails? It shows me that you’ve already subscribed. Welcome! How do I subscribe to your email blog posts? As you stated, “all in the family” are not ready to declutter or help one get started. I find myself so frustrated at this, especially, with my husband. Usually, everything with a flat/empty surface becomes a “catch all” for papers, books/magazines, etc… things that he says needs to be gone through to shred, but he doesn’t get “around to it”. I go through piles and piles of receipts (w/ personal info on it), mail (bills, even though, we do most of our bill pay online he continues to want to see the actual bill) which awaits shredding. I go though the mail, shredding all the envelopes and other things that came with them and put the actual “needed” info in boxes for him to go through, yet somehow he seems to think something important has been misplaced or destroyed. I’m at a loss for how this makes me feel, so I just leave the clutter… it becomes very depressing to me to even think about beginning. We have three sons, now grown with homes of their own, and I can say that while they were still at home none of this happened. I was able to keep the clutter at bay. He and I, both, work and he doesn’t see the importance of helping, in any way… it should be simple to “tidy up/declutter” a small 1000 sq ft home, but it becomes more difficult when the clutter becomes unbearable. Do you have any answers/help for me? I’m at my “wits end”. I want to be motivated because I like to see a job well accomplished and would like for it to stay that way for little a while, at least. I would be so ashamed if, even, my family came without notice. Is there any answers for this situation? Thank you, in advance, for any suggestions!!! Honestly, there isn’t really an organizing solution for someone who isn’t willing to organize. And doing things he doesn’t want you to will cause a lot of marital strife. I would try telling him you have something very important you want to talk about and tell him you want to take him out to dinner to talk. (This will help no one walk away or yell, lol.) Prepare on a piece of paper the goals you have for your home and life and the things you’d like to do to get there. Talk about the vision you have for your life together and tell him you NEED HIS HELP. Let the conversation go from there into how you can work together and compromise. If that doesn’t work, the next best step is counseling, which I know sounds drastic, but it is actually such a wonderfully preventative step. Best of luck! Experienced similar situation with my husband for several years and this was my remedy until he deals with the paper clutter: Made him his own desktop, cork board/command center in a cupboard so that it was behind closed doors. He had all of his mess and I wasn’t frustrated with it anymore! I lost a large linen closet/cupboard area but no more tension between us. He goes through it once in awhile and purges but I am not at fault for throwing anything away anymore. Hope this helps you too! My husband actually has certificated training in professional, industrial cleaning. When we met, I wasn’t yet “in recovery” and may never have gotten there if he hadn’t watched how I obsessed over the house and quietly asked “How clean is clean?”. Apparently that’s a question instructors ask a lot in those courses! Powerful question when you apply it to so much? Like, what will be enough? Thanks for sharing your story, I know it helps others.